Professor and Vice President Emeritus Patrick O'Meara is a renowned scholar of international development, comparative politics and African politics. He earned his doctorate in political science at IU in the 1960's, and went on to serve in a number of roles that boosted the university's international presence and engagement. For several decades, O'Meara was the university's ambassador to the world in positions that included dean of International Programs, director of the African Studies Program, IU's first vice president for international affairs, and now, Chairman of the Center for International Education. He created the International Strategic Plan, one of the first such programs in the nation, which focuses on strengthening IU's strategic international partnerships, attracting new international students, and ensuring that IU students are prepared for the global economy. In 2011, the year of O'Meara's academic retirement, the IU Office of the Vice President for International Affairs created the O'Meara International Lecture Series in recognition of his work in international affairs and to celebrate his legacy of enriching the university's international involvement. O'Meara was born in Cape Town, South Africa, and has published extensively on the African continent, including several books such as Rhodesia: Racial Conflict or Co-existence?, Southern Africa in Crisis, and Changing Perspectives on International Education. His textbook, Africa, edited with Phyllis M. Martin, first appeared in 1977 and has been adopted by nearly 100 universities and colleges throughout the United States. The fourth edition, edited with Maria Grosz-Ngate, appeared in April 2014. O'Meara has published numerous articles in journals and newspapers, as well as country studies for the Americana Encyclopedia. He was project director for Living Africa: A Village Experience, a film on life in a Senegalese village which was funded by the National Endowment for the Humanities and was a finalist in the New York Film festival. 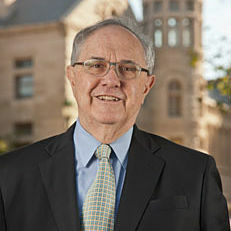 O'Meara is the recipient of multiple awards including the Cross of Saint George, awarded in Spain; the Amicus Poloniae Warsaw University Medal from the Embassy of Poland; and an honorary doctorate from NIDA University in Thailand. In 2005, on behalf of IU, he received the Higher Education Prize from the Goldman Sachs Foundation for "superior achievement in engaging students in learning about other world regions, cultures and languages." At IU, O'Meara has been honored with the Thomas Hart Benton Mural Medallion, the John W. Ryan Award, the Distinguished Service Award and the President's Medal for Excellence. In 2014, a Senate resolution on behalf of the State of Indiana formally recognized O'Meara's life and accomplishments at the Indiana Statehouse.